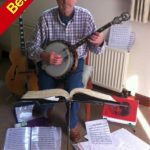 Alan Cugnoni – with his banjo on his knee! 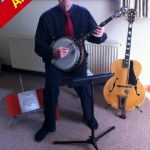 Alan Cugnoni is a banjo player and jazz band member who has been using Power Music for many years and cannot live without it now! 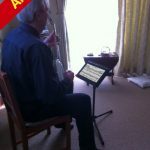 We are delighted that Power Music appeals to all ages and all types of musicians. I started playing banjo in 1956 at college when Traditional Jazz was the music of the day. I built up several chord books over the years in various books & folders before finding my faithful Kalamazoo binder. I was only a part time musician until I retired from my day job in 1995 since I have played all the usual gigs from weddings, anniversaries, concerts etc etc although reasonably organised, paper has been a pain, my Kalamazoo binder weighs in at over 4½ lbs! Then I discovered Power Music in its early form & have gone along with it ever since. I was slow at first but with the help & patience of Brenda (at Cambron) I now use it on every possible engagement. Well done Cambron it’s a great product. Alan enjoying the freedom and ease of use of Power Music after the mountain of paper before.